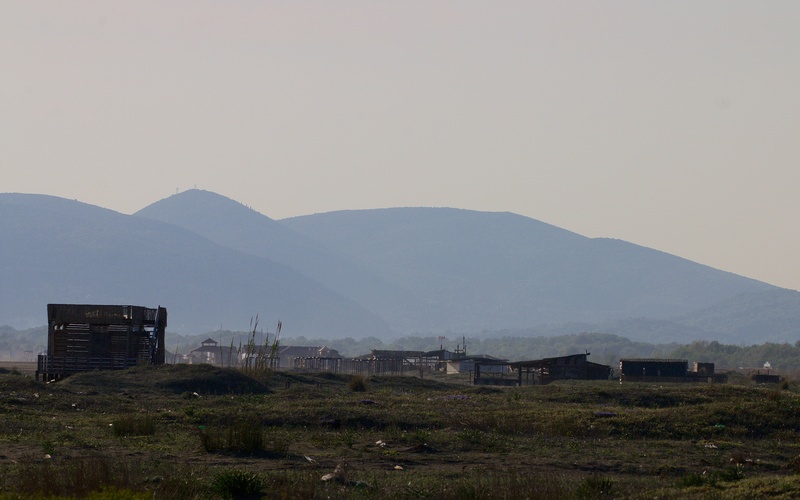 Velika Plaza on this bright evening is huge, wild and exhilarating with a strong onshore wind, warm and welcome after a hot day; it is also cluttered with ramshackle summer cabins and endless, ugly litter, much probably brought up during winter storms but much also discarded by visitors. This evening the great beach is almost empty of people but summer will soon see sun seekers and kite surfers fill the wide stage and many of the larger birds and mammals will temporarily lose their virtual monopoly. 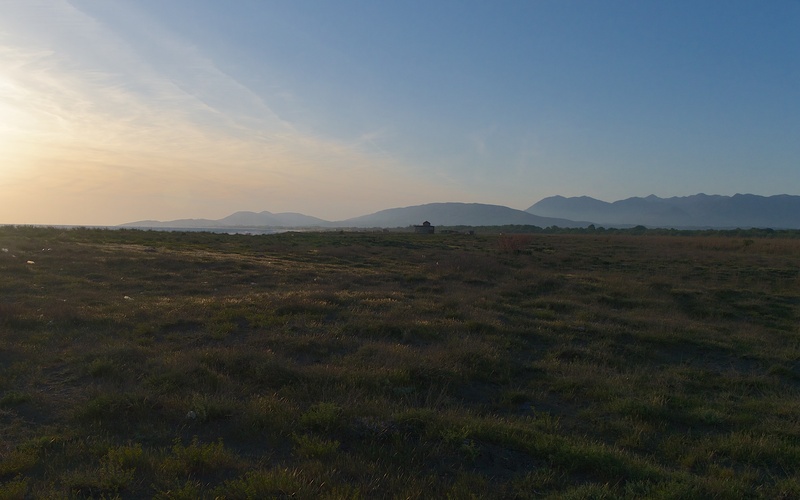 The low, vegetated dunes of Velika Plaza. The sea is white bright in the evening light, the beach is beautifully curved and gently cambered with empty, earth-coloured sands. On the beach tops there are the plant pioneers: emerging sea bindweed (Calystegia soldanella) with their violet-shaped leaves; elegant Cyperus capitatus, with arching leaves and bulbous head; and spiky tufts of blue green sea holly (Eryngium maritimum). 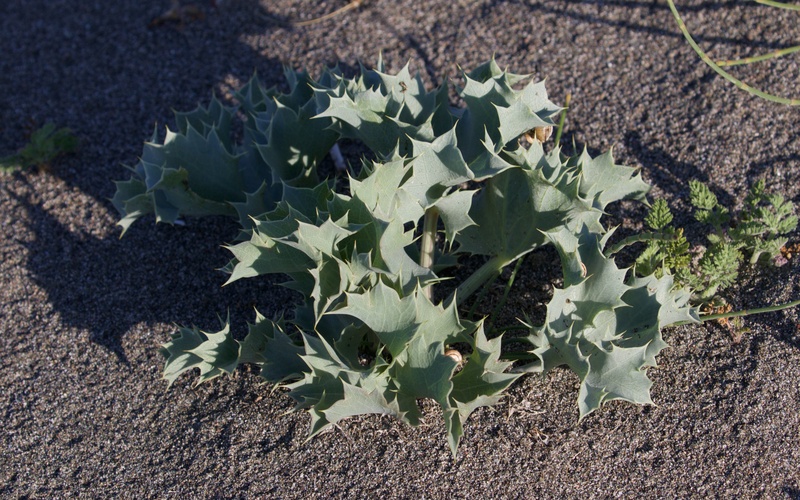 Patches of plants throughout the dunes are coated in small snails, probably Theba pisana. 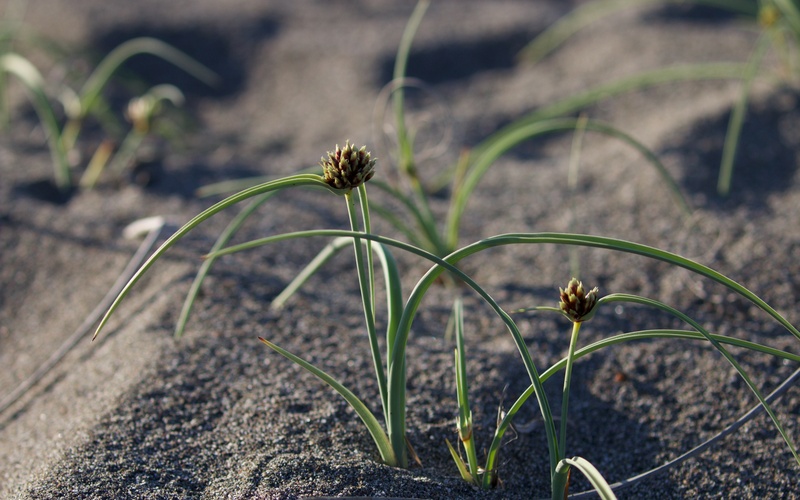 Pioneer plant species, Cyperus capitatus and sea holly on the beach-dune edge. 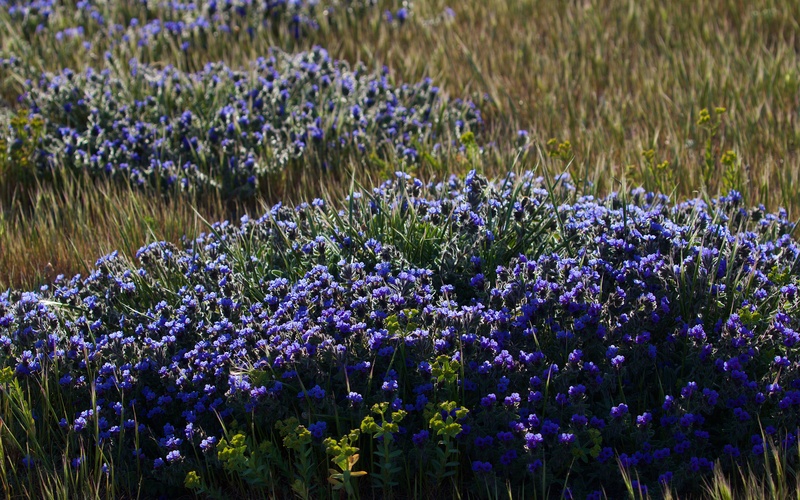 The low flowing dunes are flower rich and a mosaic of blues and yellows. The dyer’s alkanet (Alkanna tinctoria) is deepest blue and creates great circles of dark colour within a bright, yellow tapestry of Sea Medick (Medicago marina) and a small abundant Euphorbia species. Dyer’s alkanet within Sea Medick and a Tamarisk (Tamarix sp.) 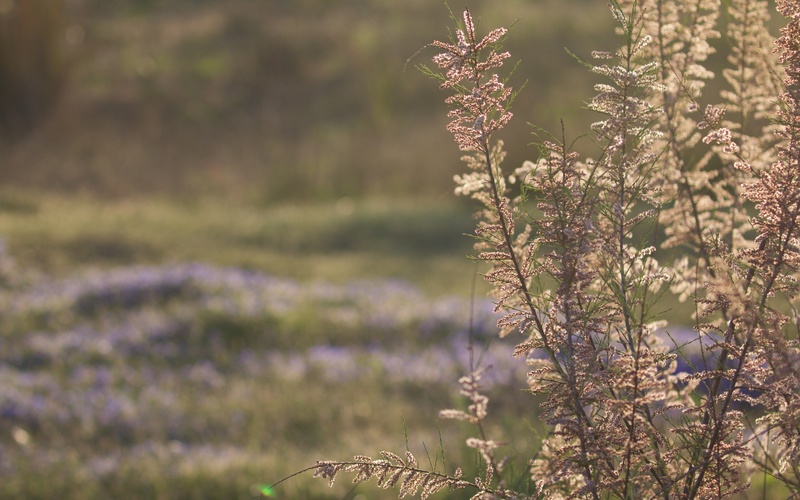 shrub flowering on the back of the dunes. On the landward side of the dunes where the vegetation is more sheltered and as a consequence better developed, the early spider orchids (Ophrys sphegodes) have faded but now replaced by pink spikes of tongue orchid (Serapia lingua) with their sleek and confusing design, a rash of diminutive sand catchfly (Silene conica) with its pretty pink flowers and patches of an equally small white crucifer, possibly sea rocket (Cakile maritima) with its white petals blown off in the wind. 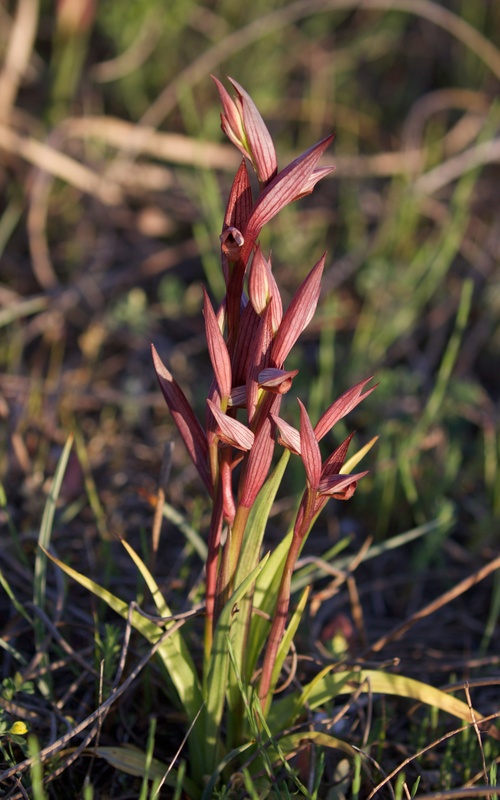 Tongue orchid and sand catchfly. The call of a little ringed plover rises over the wind; it runs across the sand in preference to flying, looking back in earnest to see if I follow. Two or three, I think, ringed plover are also on the beach where it meets the dune but the sun is low and they quickly fly away low over the sands. A distant curlew, or possibly whimbrel, flies up and away from the dune but gives no tell-tale call. There is a distant ‘coo-lee’ from the same area of dune and a stone curlew arcs around and disappears over the reed bed. Then five fly away low in the distance and, as I slowly walk over, two move on again. 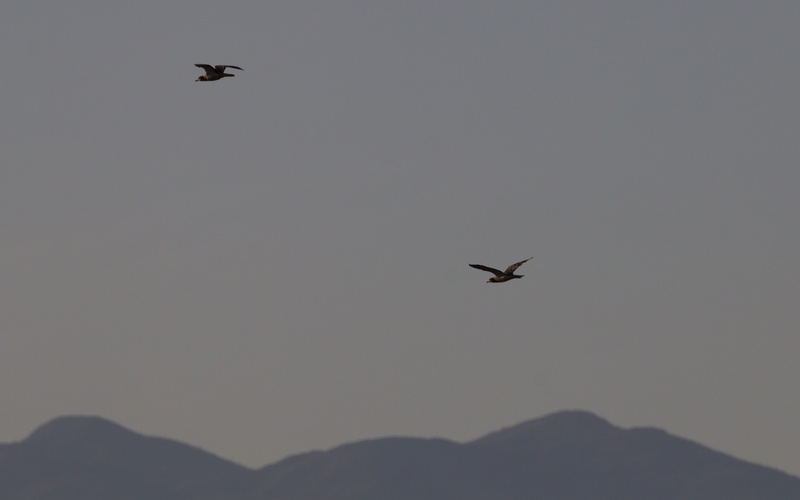 I turn for home, quickly forget them and look at the plants, and then three more get up in front of me and fly off. These cryptic but large birds often crouch and hide rather than fly. As I walk on back, a pair returns from where I had originally disturbed them. Their behaviour suggests that there are at least three breeding pairs of these iconic and wonderful birds of dry grasslands on the low dunes. 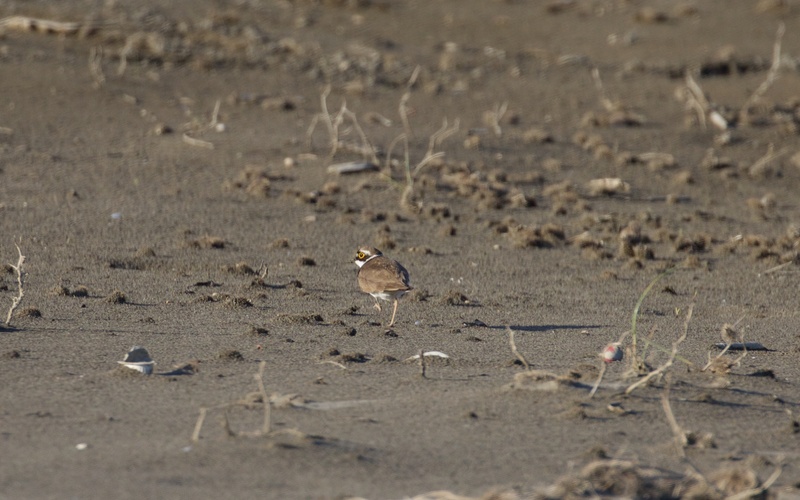 Little ringed plover running away across the sand and a pair of stone curlew returning from whence they came. 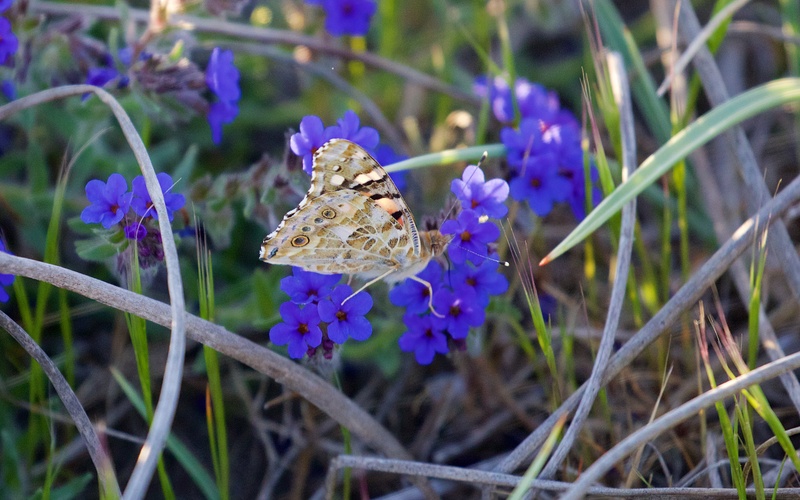 A lovely painted lady (Vanessa cardui) dashes low over the dune in the strong wind and settles on the alkanet; the patterned underside is another subtle and elegant camouflage but not against the vivid blue. Painted lady on dyer’s alkanet. Two dark brown wheatears, possibly European wheatear, and two pipits, possibly tawny pipit, flummox me as to their identification in the strong evening light. A calling skylark is much easier. Large gulls fly west along the beach in small, slow parties to a safe roost. The sun drops, the dunes darken into the evening light and the temperature cools. Evening’s end on Velika Plaza.